There are many ways of surviving. Sometimes, it’s just getting up in the morning, putting in your shift, and making it to the end of the day. The next paycheck might come as a relief, but more often, it’s just a reminder of more days to come. In your worst moments, it’s more basic than that: living one hour at a time, one bad choice after another, fighting from one demon to the next with whatever life has left you. The future is the afternoon, and the past is right now. Survival can mean many things. But there is no way to survive the State Fair. It starts with your arrival—that one time, long ago, in someone else’s body, when you had the capacity for hope. The noise from the far side of the parking lot was muted, almost hushed, and bereft of the threat it would later come to convey. You were five miles away. You walked. You kept walking. You kept walking some more. Then you were four miles away, and it was too late, because you would only find your car if everyone else left. The crowd thickened and pulled you into its gravitational well. You wondered at the fields of minivans and full-sized SUVs and monster trucks that people apparently drive like normal cars—where did they all come from? Were they all here for the fair? Even then, the question was rhetorical, a kind of mental tic to get you through the last mile and to the gate. You didn’t need an answer. The people were from everywhere. All people from everywhere had come. Even still, it was easy in those initial hours making your way past the first attraction (a lemonade concession) to imagine that the fair was simply a mistake and a lark: a tiring misadventure that would leave you laughing with friends as you recovered in the hospital. But then a man with a slathered haunch of human thigh walked by, and you said to yourself: it was just a turkey leg. I can believe that; I will believe that—if I can just leave alive. Play it cool; play their games and don’t resist. Don’t look too closely at the shape of the basketball hoop or the loose bolts on the rickety chair swing ride. They’re watching you, noticing if you fit in; if you’re going to accept it and be a good customer. Play the balloon-popping game, and pray the dart doesn’t bounce off and come straight back into your eye. Ride the Ferris wheel and laugh at the way the teenagers rock the car three hundred and sixty degrees. Play bingo and pretend to be happy if you win the imitation Tupperware that’s “BPAA-free.” Visit the rabbit barn and admire fat, depressed Benjamin Bunny. You can’t cry out in anguish; they’ll make you work for the thoroughbred pigs. Are these ears made out of baby elephants? In those long weeks you’ll think you’ve spent there, what it means to be alive will whittle down to a tiny nub, like an inedible coal of funnel cake or the leading saliva-crust of cotton candy. Life will be a mask that you put on, like the time you were pulled into an impromptu Renaissance fight and giggled maniacally at being accidentally (?) stabbed with a dirk. Even the cosplayers were not sure of themselves then, and that’s saying something. They are perpetually inflamed with mead. 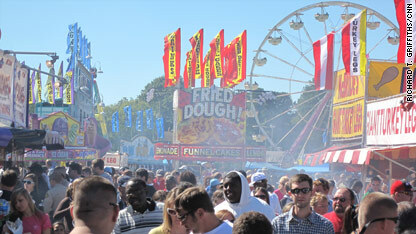 You might be able to leave—at some point—but the State Fair is never done with you. The deep-fried beef jerky will become an internal organ of its own. Your arteries will slowly become bacon-wrapped. The noise and the smell and the giant off-gassing stuffed animals will always be with you, following you into what used to be called your dreams and are now too dreadful to be thought of as nightmares. Do you hear the music? Do you see the lights? Just close your eyes and wedge in between two sleeveless shoulders—they’ll carry you where you need to go. When they finally drop you next to the remaining car, and scream away in a monster truck with their one-year-old safely strapped to the hood, you’ll be free to go. Soon you’ll make it to another hour, and then another day, and then another month, and the memories will fade. You can’t call it living; you can only call it waiting. Because it’ll be back next year. Previous Previous post: How Are We Supposed to Get In This Church?